Registration: Space is limited; advance registration required. To register click here. You will receive additional information once you register. Lynden’s Teaching Artist-in-Residence Sally Duback will lead you through the process of making paper pulps from old cotton, linens, hemp and paper in a Hollander beater. Natural materials, including the algae harvested from our Little Lake, will provide additional variation. The group will start by using pulps to make sheet forms for books, prints or missives. Next will come larger sheets that incorporate designs with colored pulps and collaged items—an opportunity to move beyond the functional to the purely aesthetic. Finally, and most daringly, you will experiment with poured forms including small sculptures or vessels. 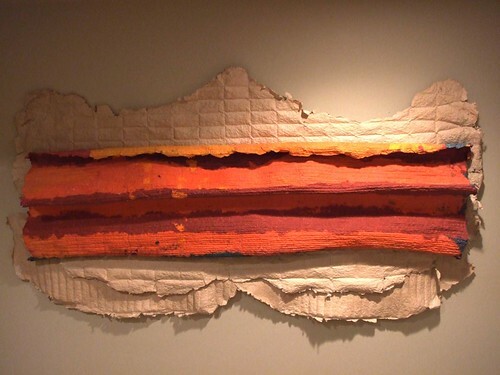 Papermaking is a collaborative process, and the possibilities offered by the medium straddle the two- and three-dimensional. The weather will be beautiful, and much of the work will be done outside. Whether you are an artist with an interest in working in a new medium or someone who has always been curious about paper, Duback encourages you to join her in her ongoing exploration of pulp. Sally Duback has been making art since she was a child and teaching art since 1969. Her work hangs in the Milwaukee Art Museum and in many private and corporate collections. Sally has studied at Vassar, the University of Michigan, the University of Wisconsin-Milwaukee School of Fine Arts and the Vermont Studio Center. To bring art to disadvantaged children, she cofounded Artists Working in Education in 1998, which received a 2002 Wisconsin Governor's Award for the Arts. You can see more of her work at www.sallyduback.com.